A man has been arrested in connection with a suicide bomb that killed at least 22 people and injured 50 others, police have confirmed. Following the blast at the end of a concert by US singer Ariana Grande in Manchester last night, Greater Manchester Police have arrested a man (22). So-called Islamic State terror group have now claimed responsibility for the attack. There was an overwhelmingly-young audience at the gig. Georgina Bethany Callander (18), Saffie Rose Roussos (8) and John Atkinson (26) are among the first victims named. Twelve children under the age of 16 were among the 59 casualties taken to hospital after the terror attack at Manchester Arena, David Ratcliffe, medical director of North West Ambulance Service has said. Greater Manchester Police said a controlled explosion has taken place at an address in Fallowfield as part of the investigation into the Manchester bomb attack. "Can I start by once again passing on our heartfelt sympathies to all the innocent people caught up in last night's despicable act. 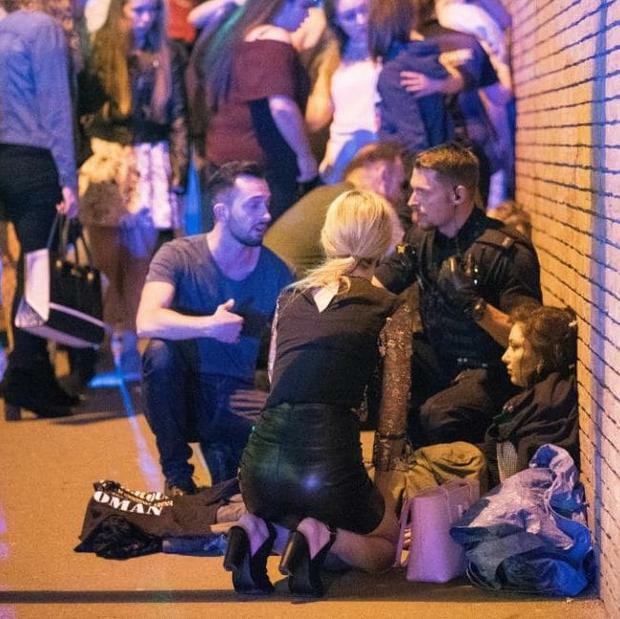 Concert goers react after fleeing the Manchester Arena after the explosion. "We now have a team of specially-trained Family Liaison Officers who are supporting families. "There has been much speculation and names of those who may have been killed in the media and social media. We accept that this is inevitable however we ask that people allow the police and coroner to release the names once the families are ready and appropriately supported. "As you would expect the police response to this across Greater Manchester has been significant as we support people to go about their daily business. "Part of this response has seen us arrest a 23-year-old man in connection with the attack and we have also carried out two warrants, one in Whalley Range and one in Fallowfield that included a controlled explosion to enable safe entry. "We understand that feelings are very raw right now and people are bound to be looking for answers. However, now, more than ever, it is vital that our diverse communities in Greater Manchester stand together and do not tolerate hate. "We have been visited by the Prime Minster and Home Secretary and we have taken them through the emergency response so far and what we plan to do in future days. "I can confirm that the man suspected of carrying out last night's atrocity has been named as 22-year-old Salman Abedi. However, he has not yet been formally identified and I wouldn't wish, therefore, to comment further. "The priority remains to establish whether he was acting alone or as part of a network." The Queen's Buckingham Palace garden party has observed a minute's silence in memory of the victims of the Manchester terror attack. Moments after the Queen and members of her family arrived at the party a drum roll signalled the start of the tribute. On the lawns of the Queen's London home thousands of people stood in tribute to the 22 people, including children, killed in the blast and the 59 injured. 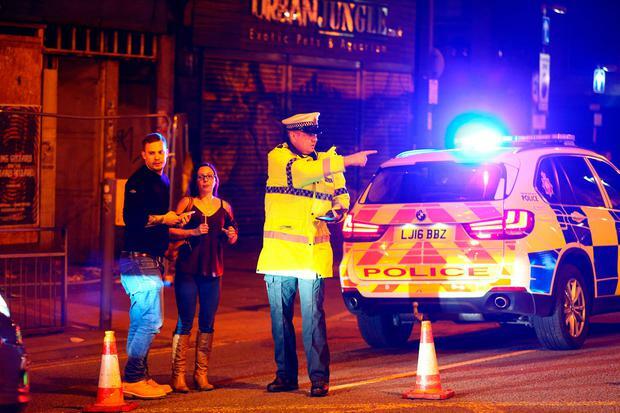 The victims were targeted by a suicide bomber who detonated an improvised explosive device as young fans left a pop concert by US singer Ariana Grande at Manchester Arena. The Queen was joined at the garden party by the Duke of Edinburgh, the Prince of Wales, Duchess of Cornwall and Princess Eugenie. The minute's silence was observed just before the playing of the national anthem which is normally held before garden parties begin. In a message of support released earlier the Queen said: "'The whole nation has been shocked by the death and injury in Manchester last night of so many people, adults and children, who had just been enjoying a concert. ''I know I speak for everyone in expressing my deepest sympathy to all who have been affected by this dreadful event and especially to the families and friends of those who have died or were injured." It is the deadliest militant assault on Britain since four British Muslims killed 52 people in suicide bombings on London's transport system in July 2005. Police responded to reports of an explosion shortly after 10:30pm at the arena, which has a capacity for 21,000 people, and where the US singer had been performing to an audience that included many young people. Greater Manchester Police released a statement shortly before 7am on Tuesday reviewing the death toll from 19 people to 22. They added that a lone male attacker, who died in the blast, was carrying an improvised explosive device which he detonated. Emergency services received 240 calls following the incident. He added: "Families and many young people were out to enjoy a concert at the Manchester Arena and have lost their lives. There are nine people in critical condition, eight adults and one child. There are reports - not yet confirmed - that the explosion happened in a foyer of the Manchester Arena, an area where beverages were being served, and where people may have been queueing to exit as the concert finished. Earlier, a father had described seeing "carnage everywhere" in the wake of the explosion that left around 30 people, including children and disabled victims, lying on the floor. Andy Holey said he was blown "about 30ft" by a blast that shook the building as he waited to collect his wife and daughter at the end of the gig. Mr Holey said he later saw panicking families trying to find loved ones in the wake of the incident on Monday night. He told BBC News: "It's shocking what happened. Just carnage everywhere. There was a good 20 to 30 of them [victims]. Some were young kids, some were disabled people." Mr Holey said he helped emergency services treat the wounded who were "scattered" by a blast near a box office. He said: "As I was waiting an explosion went off and it threw me through the first set of doors about 30ft to the next set of doors. "When I got up and looked around there was about 30 people scattered everywhere, some of them looked dead, they might of been unconscious but there was a lot of fatalities. "My first thing was to run in the stadium to try and find my wife and daughter. "When I couldn't find them I looked back outside and the police, fire and ambulance were there and I looked at some of the bodies trying to find my family. "Luckily they weren't there, I managed to find them outside the arena and got them back to the hotel." Ms Grande, who fans had travelled to see perform, has said she is "broken" following the attack: "From the bottom of my heart, I am so so sorry." British Home Secretary Amber Rudd said the Manchester explosion was a "barbaric attack, deliberately targeting some of the most vulnerable in our society". A fund for the victims of the Manchester suicide bomb attack has seen more than £500,000 pledged in support for those affected. In the wake of the deadly blast local news organisation the Manchester Evening News set up a crowdfunding initiative following requests from readers on how they could help. Just 10 hours after its launch, more than £550,000 had been donated by thousands of people to the families and victims of the atrocity, which saw 22 killed and many more injured. Manchester Evening News editor-in-chief Rob Irvine said: "Our wonderful city of Manchester has been terribly wounded. "But it is a huge solace to see the response of individuals and organisations who have responded to cowardice and evil with kindness and generosity. "More than 21,000 people have supported our fund-raising appeal to the tune of close on £550,000, and the figure of donations is growing all the time. "We are arranging with a charity to ensure this financial support, some of it from large corporations, reaches the families of those affected by this appalling tragedy." * Police said around 50 people were injured, while North West Ambulance Service said 59 casualties had been taken to six hospitals around the city. 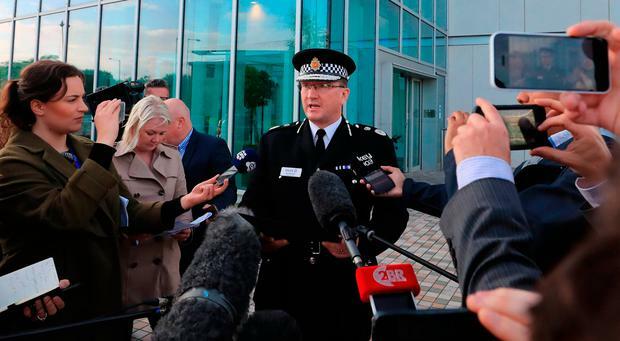 * British Greater Manchester Police said a lone male attacker, who died in the blast, was carrying an improvised explosive device which he detonated. * British Home Secretary Amber Rudd has described it as a "barbaric attack", while British Prime Minister Theresa May said her thoughts are with those affected by the "appalling" incident and will chair a Cobra meeting on Tuesday. * Officers carried out a controlled explosion on a second suspect item, which they later said was abandoned clothing. * Police are appealing for people to share their footage and images of the incident or the aftermath of the incident to a closed portal online, where they can begin an analysis for their investigation. The Irish Minister for Foreign Affairs and Trade, Charlie Flanagan TD, said: "I am shocked and horrified by the large loss of life in Manchester last night and my thoughts and prayers are with those affected, and we stand by our nearest neighbour, the U.K. especially due to the strong links between our country and the city of Manchester." "The Consular Section of my Department, in conjunction with our Embassy in London is monitoring the situation and we are not at this time aware of any Irish citizens affected." The Taoiseach Enda Kenny added: "The vile acts carried out in Manchester last night are a reminder of the depravity of the views held by the few. "Those beliefs have no place in our society. "My thoughts and prayers are with the victims, their families and all those affected by this atrocity. I am heartbroken for all." Archbishop Eamon Martin said this morning he is praying for "the dead, the injured and for all affected by the bombing." “I have sent a message this morning to Bishop John Arnold, Bishop of Salford, to express our shock and sorrow at the horrific bombing in Manchester last night," Archbishop Martin said in a statement. "Such a violent and brutal attack inflicts terror and long-lasting trauma on children and families and leaves a wound that can only be healed by compassion, love and solidarity. "We are praying for the dead, the injured and for all affected by the bombing. Such an awful attack challenges us all to resolve personally to build peace, solidarity and hope everywhere. Only in this way can the hearts of those who plan and perpetrate such violent and pointless attacks be changed. "I will remember the victims of this attack and their families in my Masses and prayers, and I know that the prayerful solidarity of people across Ireland goes to the people of Manchester at this sad time." There was no immediate claim of responsibility, but US officials earlier drew parallels to the coordinated attacks in November 2015 by Islamist militants on the Bataclan concert hall and other sites in Paris, which claimed about 130 lives. "The choice of venue, the timing and the mode of attack all suggest this was terrorism," said a US counter terrorism official who also spoke on condition of anonymity. 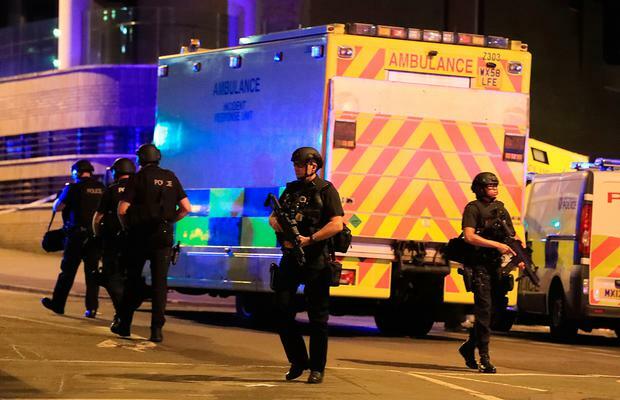 The UK is on its second-highest alert level of "severe" meaning an attack by militants is considered highly likely. In March, a British-born convert to Islam ploughed a car into pedestrians on London's Westminster Bridge, killing four people before stabbing to death a police officer who was on the grounds of parliament. He was shot dead at the scene. In 2015, Pakistani student Abid Naseer was convicted in a US court of conspiring with al Qaeda to blow up the Arndale shopping centre in the centre of Manchester in April 2009. Joanne Johnson has described the chaotic scenes in and around the venue. “When the loud explosion happened and the building shook, people at first didn’t realise and thought it might be something technical. When people from the back of the arena started streaming into the main arena, the screams were horrific and you knew it was something serious. “For people to run from the exit area inside where they had nowhere else to go, you knew it was serious," Joanne added. Gary Walker told BBC Radio 5 live’s Colin Paterson he was “metres away from an explosion” while waiting to pick up his daughter from a concert at the Manchester Arena, and how he had to lie with his injured wife for nearly an hour. Gary described how his wife suffered a “stomach wound” and “possible broken leg”. “Someone came through the doors then bang,” he added. One fan at the concert with his sister described how the apparent explosion hit the venue as they were leaving the building. Majid Khan, 22, said: "I and my sister, along with a lot of others, were seeing Ariana Grande perform at Manchester Arena, and we were all exiting the venue when a huge bomb-like bang went off that hugely panicked everyone and we were all trying to flee the arena. Oliver Jones, 17, was at the concert with his 19-year-old sister. He said: "I was in the toilet and heard a loud bang just after the concert had finished and people had started to leave. "The bang echoed around the foyer of the arena and people started to run. "I seen people running and screaming towards one direction and then many were turning around to run back the other way. "Security was running out as well as the fans and concert goers. "Reports of blood and people injured." He added: "In so much shock and panic. You see this on the news all the time and never expect it to happen to you. I just had to run and make sure me and my sister were safe." Footage posted online by one concert-goer shows fans filing out of the building while an announcer attempts to maintain calm. The voice can be heard saying: "Ladies and gentleman, please take your time, there's no need to bunch up, there are no problems here - just take your time and keep exiting the building." A barman at the nearby Steven Charles Snooker Club, who gave his name as Tyler, said he saw people lying on the ground covered in blood. "We've had a few people in with panic attacks and in all kinds of disarray," he told Press Association. "We've got four girls here - trying to get them sorted to get picked up. "There was a gentleman on the floor with his leg all bleeding and woman with blood down one side of her face. "We felt something but didn't know what it was - there was a sound like thunder. "One girl had a panic attack and another had streaming tears, a woman had a heart attack just outside. "It's a lot of teenagers - they're all in tears." Suzy Mitchell, 26, whose flat is opposite the venue, reported a huge bang rocking the neighbourhood. She told the Press Association: "(I) just heard a huge bang from my bed, came out to the front of my apartments (we're on the top floor so have perfect view) and everyone was running away in big crowds. "The bang was so big I heard it from my room which is at the back of the apartment blocks. "Currently lots of emergency services going to and from. But can't see anything substantial as of yet except fleeing people and lots of cars." Liverpool City Region metro mayor Steve Rotheram tweeted: "My 2 daughters caught up in the Manchester explosion at the arena. They are thankfully safe, but I fear for others." He posted later: "Confirmed deaths at the Manchester arena. Feel sick to think that people have lost their lives at a gig attended by so many young people. "All my thoughts go out to those parents waiting to hear of the safety of their children. It's a parents worse nightmare. So, so sad." The Lord Mayor of Dublin, Brendan Carr, will open a Book of Condolence for the victims of the tragedy at the concert in Manchester on Wednesday 24th May, 2017. Lord Mayor Brendan Carr said; "I was horrified to hear about the attack at a concert for young children in Manchester last night. "There has always been close ties between the cities of Dublin and Manchester and I am opening this Book of Condolence to let the people of Dublin express their sympathies to the families of those who died or were injured and to express our solidarity with the people of Manchester at this dark hour."